Dietrich Bonhoeffer was a Lutheran theologian in Germany during the reign of Adolf Hitler. His book, "The Cost of Discipleship", has become a classic. Focusing on the "Sermon on the Mount", the book more or less spelled out what Bonhoeffer thought was the true way to follow Christ. In addition to his theological writings and teaching, Dietrich Bonhoeffer was a staunch, anti Nazi dissident. He spoke out vigorously against Hitler's euthanasia and genocidal persecution of the Jews and, in so doing, became a hated enemy of the Third Reich. As such, he was arrested in April, 1943. Accused of the ambiguous crime of "plotting against the Nazis", he was hanged on April 9, 1945. We are absolutely fascinating creatures, we humans are. Many of our species can be so kind and compassionate, loving and gentle, sweet and understanding. Many people will save a tiny bird with an injured wing or a cat stuck up in a tree. There is a world-wide outrage going on directed at a dentist who killed a lion. There are so many people who will feed the hungry, clothe the naked, visit the sick and give drink to the thirsty. One thing about the animal kingdom: the different species are predictable. One thing about we human beings: we are not. You flip the coin and you have many of the very same species who are filled with a self-gratification which culminates in a hate and disdain for others of their own kind. These include those who will torture and kill their fellow humans because they HATE their: religion, skin color, birthplace, political beliefs or whatever other self-serving, hate-filled reason a murderer may come up with. Many kill and torture saying they were "only following orders" and had no choice. Others kill because of pride fueled by envy and greed. Planned Parenthood, a non-profit, government-funded organization, employs people who perform over 320,000 abortions a year on babies of ALL sizes. They even sell their body parts for profit and say "it is LEGAL". Barely a word is said by many folks who are part of the mainstream media (print & broadcast). The leading Democratic candidate for President of the U.S. says that those reports are "disturbing". Are you kidding me! Disturbing! How about heinous, hateful and/or murderous. So I ask why? 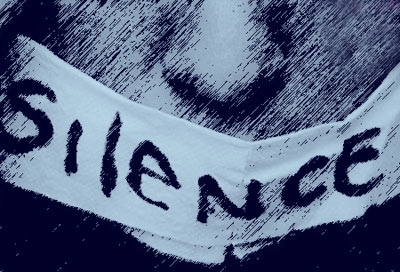 Why the "Shameful Silence" from so many? Why are we, all of the same species, so different in our hearts? How can some of us kill and others forgive them for doing so? Why do some of us willingly and joyfully give of ourselves for people we may not even know? Why do some of us hate others they may not even know? Why are there those who love their fellow human being unconditionally? And why the "Shameful Silence" from so many? The answer has to be because of the very existence of "Good vs Evil" that is always trying to invade our very souls. Many people fight back and conquer the invader. Many others give in and welcome him and embrace his twisted deception. What is "Good vs Evil"? I can tell you what it is and I do not care if you disagree. It is the war waged by Satan and those that follow him against the God of Love that created him and all of his followers. If you take a breath and look at the world of today and then glance back at yesterday and the centuries before, what has changed in the hearts of man? Apparently, not very much. Love and Hatred have danced "toe to toe" since Cain slew his brother Abel. Why did that happen? Pride and envy. What drives the evil of today? Pride and envy. God is real and Satan is real. God is the Creator of the Universe and the Master of Goodness and Love. His most beautiful creation, Satan (aka Lucifer) thought he was greater than God and turned against Him. He was cast from God's presence by those angels that stayed true to their Creator. Filled with an unimaginable hatred for all that is good, Satan and his minions prowl the earth fomenting lies and deception to all who will listen. He and his fallen angels have used their cunning to gain entrance into the hearts of those who, before all else, love themselves. These are the easy prey for the king of deceit. And, there is a gaggle of easy prey available, especially in today's secularly charged world dominated by 'meism'. Mosul, the very cradle of Christianity, can trace the followers of Jesus back to the first century. As of today it seems that the entire Christian population of Mosul has been purged from this ancient and historic city. Murder, including the beheadings of civilians and the wanton murder of women and children, has virtually eradicated the city's Christians. And what did we see and hear from the print and broadcast media a year ago? We heard the sound of almost nothing. What do we hear today about the atrocities of killing pre-born babies and selling their body parts under the guise of "saving lives"? We hear the sound of almost nothing. A "Shameful Silence" from many seems to reverberate throughout the world when persecution is running rampant. Dietrich Bonhoeffer said it, "Silence in the face of evil is evil itself." He was hanged by the Nazis for his "crimes" over 70 years ago. What has changed? The press was quiet then as the Nazis purged the world of the "hated Jew". Most of the mainstream media (print and broadcast) has been quiet as the Islamists purge the world of the "hated Christian". There are many people in the United States of America, who go to work every day and kill living babies in utero and sell their body parts and have no problem whatsoever doing it because, as the Nazi workers said so many years ago, "it was legal". Josef Goebbels was the propaganda minister for Adolf Hitler and made sure the press and broadcast media kept news of the Nazi Final Solution quiet. There existed a Shameful Silence. That Shameful Silence among many is apparently alive and well in 2015, right here in the USA. Nothing has changed, nothing at all. Nine and a half years ago NASA's New Horizon spacecraft left our humble, little planet and began its voyage to to the edges of our solar system and beyond. After traveling 3 billion plus miles New Horizon finally passed Pluto, the furthest planet from our sun. I don't know about you but I find it so humbling and awe inspiring that we human beings, using the perfection that surrounds us, can mange to find a planet that is so far away. Yet, within our universe, it would be as close as a neighbor down the street. Let's move past Pluto. It seems NASA's Kepler Space Telescope, launched in 2009, has found a possible 'exoplanet'; something worlds beyond our puny solar system. This exoplanet could be similar to our hometown, Earth. Hello sister planet, Kepler 452b. The Kepler Telescope has identified close to 5000 exoplanets since it started scanning the deepest parts of space. But this is the first one that could be just like Earth. Now, get this--it is one thousand and four light years away. Our closest star system is Alpha Centauri, a mere 4.3 light years away. That means our closest star system is trillions of miles from our solar system and would take us tens of thousands of years to get there. Kepler 452b is 200 times further than that. My question is--how can we know these things? How can we possibly know how to measure distance and location and density and climate relating to places that are so unimaginably far away? The speed of light is 186,000 miles per second. Who figured that out? How do you measure the speed of light? Assuming the number is correct, that means in one minute light travels 11+ million miles. That would be almost 16 billion miles in one day. Multiply that number by four and a half years. Do you see where I'm going with this? The light from our own sun takes eight minutes to reach Earth. Yet Kepler 452b is more than a thousand "light years" away and our scientists know it revolves around its sun in 385 days vs our 365 days. WHEW! What about Earth? How much of what Earth does do we take for granted? Well, here is one thing it does that we never think about but without its never ending accuracy we would have chaos. That is TIME. There are 24 hours in a day. Not 25 or 23 or 24.8, but 24. Imagine if there were random hours in a day. Yeah, right. So how did we get 24 hours in a day? Enough---let's just take it for what it is. MIND BOGGLING. What about explosions? (Please bear with me--I do intend to make a point.) Explosions are destructive and, for the most part, maim, kill and destroy. This past Fourth of July a guy in Maine, in a festive frame of mind, brilliantly set a rocket off from the top of his head. He died instantly. Jason Pierre Paul, the all-pro defensive star for the NFL's N.Y. Giants, blew several fingers off his hand with fireworks. He will be out indefinitely. C. J. Wilson, of the Tampa bay Buccaneers, retired because he blew several fingers of his hand with fireworks. We can go back 70 years and remember that on August 6, 1945, the atomic bomb blew the Japanese city of Hiroshima to smithereens. It also killed about 80,000 people. It follows that if I set a bomb off in my car the chances of the result being a nicer car are--well, ZERO. So now--to the point. The Big Bang Theory of Creation has become the favored explanation of how our seemingly infinite universe came into existence. Scientists do agree that the universe did, in fact, have a beginning. They also know that the universe is expanding and changing and dying, just like we do. To the question: At the moment of creation when the unimaginable explosion took place or whether it was something like a giant balloon expanding and expanding until it "popped" spewing matter outwards, it all had to be controlled. Who did that? Bottom line: because the universe is so vast and expansive (and apparently infinite) and all of it is moving and changing within a perfectly ordered system proves someone bigger and smarter than any of us put this in place. We cannot understand this. We cannot scientifically prove it. But, no matter what, we live in it and survive by it every second of every day of our lives. Perfection does not come from chaos. Perfection can only come from someone who is PERFECT. I know who that Person is even though I cannot see HIM or touch HIM. All I have to do is see a rising sun, a blooming rose, a full moon, a rainbow...or hear the cry of a newborn baby or ponder the magic of one snowflake, unique unto itself. Maybe Dr. Seuss nailed it in his famous book, "Horton Hears a Who". Maybe our planet Earth is really no bigger than Horton's, "Whoville". Maybe we are specks on the end of a ball of dust. Maybe we are not as big and as smart as we think we are. We had to have a Creator. It is common sense. It is ultimately all in HIS hands. I am also sure HE subscribes to the famous sentence in Dr. Seuss's book; "a persons a person no matter how small". Maybe those very "smart" people who reject what must be so, need to breathe in a deep dose of humility and realize that this all did not just happen as the result of some random explosion or expansion. It is illogical and makes no sense (to me). The picture to the right was taken at my daughter's wedding and it was a happy day. Facing the picture, the young fellow on the left is my "baby" brother, Johnny. The one to his left in the back is my brother, Bobby. I am to the far right, my sister, Carolyn, is in front of me and my brother, Danny, is to her left in front of Bobby. The young man with the silly grin on his face is my son, Larry Jr. who was really having a "good" time. The little guy is my grandson, Darren. He is now in college. I posted this photo because there are very few photos of the five of us together. There has been a lot of death in our family over the years. Bobby died in 2007 from cardiac failure. He was 53. Carolyn's husband, Bob, died back in 1993. He had a brain-stem tumor. He was almost 53. My wife, Loretta, died (melanoma) in 2003. She was 58. Danny's wife, Annie, died (emphysema) last April. She was 64. Our mom died at 40 from leukemia. Our dad died at 53 from Pancreatitis. We had a stillborn daughter, Theresa. Her life span ended while entering the world. And then, the other day, our brother Johnny, (I also called him "Little Bro" and he called me, "Big Bro") died. He was 56. Unlike the others, Johnny's death was self-inflicted. This I do not understand. Therefore, I have turned it over to God....totally. It is a beautiful thing when you do have an abiding faith in the God above to help you climb over the rubble of life. And yes, this left a serious pile of rubble for sure. I will not analyze or try to figure out "what happened". I just ask anyone who might read this to say a prayer for "Little Bro" and for his wife and family. We have the peace of knowing that Johnny is now with his most loving and merciful Father and is in "GOOD HANDS". Also, maybe say a prayer for me. I am unable to attend Johnny's funeral today and I am quite "in the dumps" about it. I should be with the rest of my family. However, being a caregiver to an Alzheimer patient (my wife) can sometimes leave you unable to act on unexpected life situations. I will go to 8 a.m. Mass in my parish and I will be OK. Anyway, today we say GOOD-BYE to the "baby" of the family. It is a hard day for all of us but God and His Son and our Brother, Jesus, do have our backs. WE will feel their comfort and the loving hand of Mother Mary will guide us along. Love you "Little Bro". Our dear cousin, Vicki Nelson, had a wonderful memory of Johnny back when he was seven years old. She wrote an essay about it and it came straight from her heart and I am posting it now--in honor of "Little Bro". Thank you Vicki. To look at him that summer morning, no one would ever guess he had a care in the world. And in that moment, I suppose he didn't. Still, it must have been confusing for him. Here he was ‐ a seven‐year old kid from the Bronx suddenly transplanted with his eleven year old brother for the summer in his uncle's new house in the New Jersey suburbs. The brothers were recently orphaned after a short span of time where first their mom, then their grandma, and finally their dad died. The two boys had three older siblings, one of whom was a bonafied teenager and the oldest two were barely old enough to be considered real grown‐ups. How it was going to work out, no one really knew. Uncle Larry had four kids of his own, plus a wife and mother‐in‐law to support. He had just bought a larger house to accommodate his growing family and they barely had two nickels to rub together in those days. He was a one man show with his nuts and bolts business that was touch and go lately. Still he did what he could for his sister's kids. He was their beloved Uncle Larry even if he did live in Jersey. And in Jersey, everyone had lawns. Having a lawn and then complaining about cutting the grass was the main reason people moved across the Hudson River. Uncle Larry had not put in the backyard lawn yet. Hundreds of weeds needed pulling and rocks needed removing. The earth was soft, however, and Aunt Gloria promised to pay each working kid a penny a weed ‐ easy work for a bountiful harvest that awaited. Brother Bobby got the bright idea to remove some of the leaves from each weed thereby maximizing his profit for each weed. Aunt Gloria, originally a city kid from New York herself, quickly wised up to the shenanigans and so we all picked weeds for free from then on. I don't really remember how the next part came about ‐ maybe we just finally had enough land to do it. Or maybe it was just that we were already outside so much anyway, digging in the dirt and pulling weeds. Somebody got the idea to plant our own vegetable garden so we picked a nice flat spot way out back and sowed seeds from little packets. We planted the usual ‐ tomatoes and zucchini and bell pepper plants and ‐ Johnny's special request ‐ watermelons. New Jersey is the Garden State and our plants just grew like crazy. The watermelon plants grew hundreds of leaves that spread out all over the place. Johnny would jump out of bed first thing every morning and run to the garden patch in hopes of spotting his first watermelon. The tomatoes eventually turned red, the bell peppers and zucchini grew in abundance too. Meanwhile, Aunt Gloria was beginning to suspect that the watermelons were not going to produce much more than green leaves. So she planned a little surprise for Johnny. The next morning, like clockwork, Johnny ran out the back door to check on his watermelon patch. In a few minutes we could all hear his ‘hootin' and ‘hollerin.' "I got one! I got one! I got my very own watermelon! Everybody ‐ come look!!!" We could see him from the window. He jumped up and down, hopping from one foot to the other with that blond curly hair bouncing and his blue eyes shining. We all went running out the back door to meet him as he continued jumping with that toothless seven year old grin, as he proudly displayed the roundest most beautiful little Sugar Baby watermelon any of us had ever seen in our entire lives. Of course we older kids were in on it but congratulated Johnny heartily on his superior gardening skills and his prize watermelon. He just beamed from ear to ear. Aunt Gloria put it in the fridge so it would be a nice cold dessert on that hot, summer night. I will never forget his little face or for a moment, the sheer happiness and delight that one watermelon could bring to one small boy. He never forgot it, either. Many years later, when we reconnected over the telephone after going our separate ways for a long time the way adults just do, we spoke with delight of the watermelon story again. And just for that moment, remembering, we were those two kids again. Rest in Peace, Johnny. You and your watermelon are forever in my heart. We got up and followed him and, without hesitating, Dad walked up to Leo’s apartment door and began banging on it with his fist. We watched from the stairs as the door slowly opened. Leo poked his head out and just like that my father was embracing this little Jewish man who had buried his head in Dad’s chest crying unashamedly. My brother and I crouched down, and peeking from the landing above, were stunned. Then Dad disappeared into that apartment with Leo Rabinowitz and did not leave for several hours. Sophie Rabinowitz was having nightmares all right, recurring nightmares of her two boys, ages 12 and 9, being clubbed to death by the Nazis as they made her and Leo watch. Try as I may, I cannot imagine what those moments in their lives were like. They were loving parents and were helpless, unable to save their very own children as godless people clubbed them to death simply because they were Jewish. The Nazis tortured the parents further by allowing them to live. Such evil can only come into people and be accepted by them if coming from the very bowels of "Hell" itself. My father has been dead for many years but he is still teaching me about being Catholic today. How? Through the gospel reading from Matthew 5:1-12---aka The Sermon on the Mount. This is when Jesus, a Jewish man, gave the world The Beatitudes. The one that always grabs me is #2, “Blessed are those who mourn, for they shall be comforted." I remember that Friday night long ago. I remember how a Catholic man reached out to his Jewish neighbor and how they became friends. My father became their ‘comforter’ who initiated the mourning process for Leo and Sophie. They had never mourned their boys. They had "stuffed the nightmare" and tried to go on living. This was the first time they had ever confronted what had happened. Reliving the sadness and horror also released a sense of beauty that shone through it for it united them in a renewed marital bond that had been missing for close to twenty years. They now became each other's strength. We Catholics read and hear during the Mass what is called the Roman Canon (aka First Eucharistic Prayer). The following words are said by the priest prior to the words of consecration: “In communion with those whose memory we venerate, especially the glorious ever-Virgin Mary, Mother of our God and Lord, Jesus Christ, and blessed Joseph, her Spouse, —–and all your saints.” I ask you, were not all of those mentioned, Jewish? Yes..they were, ABSOLUTELY. There is no denying this fact. They are all canonized saints and their Judaism was always part of who they were and it all extrapolated into who we Catholic/Christians are today. We Jews and Christians are joined forever by Spiritual DNA. Finally, let me mention our Holy Father, Pope Francis. The Pope is very good friends with one of the primary Jewish leaders in Argentina, Rabbi Abraham Skorka. In October of 2012, he presented to Rabbi Skorka an honorary doctorate degree from the Pontifical Catholic University of Argentina. It was the first time such an honor had been bestowed on any Jewish man in all of Latin America. Upon presenting the award to Rabbi Skorka, the Pope (then Jorge Cardinal Bergoglio) said, “You cannot imagine how long I have waited for this moment.” We all should learn from this for it was a genuinely profound moment in history. It is now 2015 and Judaism and Christianity are under attack all over the world including in the United States of America. It is in our face. We have had the the absolute luxury of practicing our religions and worshiping as we so chose for as long as any of us can remember. There have always been those who hated someone for being Jewish or Catholic or a Jehovah Witness or a Quaker for that matter. No matter, we had the law on our side and it was called the First Amendment to the Constitution. All of us, Jews and Christians alike, need to pray and work together that it remains just that. Another Secularist "Triumph": Say Good-Bye to Laura---She says, "Life is Not for ME"
Her name is Laura and she is 24 years old. She is a healthy woman who lives in Belgium. She wants to die. Why does she want to die? Because, as she says, "Life, that's not for me." My initial reaction was, "Oh my God, this young woman is severely depressed or on drugs. Whatever happened to her that would lead her to a feeling of wanting DEATH? She is 24 years old and healthy. She has a whole life ahead of her. This story is all over the print and broadcast media. Why isn't someone helping her?" Isn't there anyone who has offered to give her the necessary counseling, spiritual guidance, or anti-depressants to help her see that her own "life" is not her enemy? Is there no-one who might convince her that her life is a one of a kind precious gift? Is there no one to prevail upon her that her life is rarer than the rarest diamond and more valuable than all the world's riches combined? Cannot someone show her that she is the only one in the history of the world who is SHE or will ever be SHE? Well my friends, Laura lives in Belgium and apparently in that country not too many people give a damn about the value or sanctity of life. In February of 2014, Belgium approved legalized euthanasia for children . I believe this supposedly sophisticated, civilized, and pompous nation has earned the title The Great Nation of Self-Annihilators. In Belgium you are witnessing Nihilism in all of its twisted "splendor". This is encapsulated in the total rejection of the value of life as witnessed in the upcoming assisted suicide of Laura. How sad, how disgraceful, how blatantly sinful. Doctors have given Laura the go-ahead to kill herself. They will help her to be "successful". Why would doctors do this? In Belgium many of them feel that life and death are really not such a big deal in the first place. Laura says that she has been considering suicide since the age of six. Are you kidding me! She says that she was ONLY six when she started thinking that she "didn't want to live at all". It is hard to even fathom such thoughts bouncing around inside the head of a six year old who has not even reached the age of reason. Laura has had psychological problems her entire life. In high school she was a "cutter" self-mutilating her arms. Her father had been an abusive drunk and her mother had left when she was a toddler. She grew up with her grandparents who loved her dearly but maybe the trauma of her parents' behavior was too much for her and drove her into depression. It does not matter. What matters is that this child had problems and no-one gave a damn. She was left to grow with a festering and debilitating sense of "nothingness". Now they want to help her kill herself. This is Nihilism run amok. Laura has told doctors that she needs to kill herself because, as she says, "life, that's not for me". They readily agreed and Laura has now set a date for her death injection to be administered in her apartment. The actual date is unknown. She is planning her funeral and writing final words to be read. Doctors and mental health professionals are happily helping her along on her death journey. I cannot get it out of my head that she is only 24 years old and healthy and doctors are gladly helping her to kill herself simply because she asked them to help her do it. Whatever has happened to the moral fiber of people around the world? Secularism has infested the entire world with its self-fulfilling message of false happiness. Belgium, a country that is 75% Catholic, voted 2 to 1 to pass the child-euthanasia law. The bishops in the country begged them not to vote for it. It did not matter. The attitude of many people is: What do God's representatives know about real life? For that matter, what does God know about real life? If poor Laura wants to kill herself to be happy, why not. And then they go to church. WHATEVER! Well now, if you do not have God in your life and believe that death leads to nothing then you probably find comfort in believing that "nothing" cannot hurt you. It follows that being dead will make you happy. How sad and perverse is this? But it proves one thing. While the secular world fights to eliminate God from our lives it is God who is desperately needed back in their lives. For with God comes Hope and Love and when a person has that Faith in their lives they are not asking compliant strangers with fancy diplomas to help them die. Especially when they are only 24 and filled with life.